Craig Fischer here. I'm a full-time teacher and part-time comics blogger who's friends with all the reprobates behind Team Cul de Sac. When I first visited this blog, I drooled over the terrific submissions that Chris and Richard have been collecting for the art book, but I was annoyed too. Why should artists get to have all the fun? 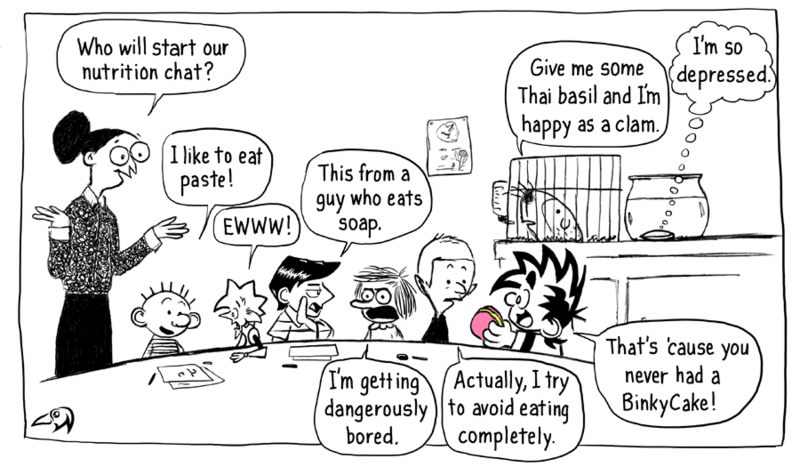 Why can't comics critics and bloggers play for Team Cul de Sac? To that end, I'm cobbling together a big, fat, old-school zine to raise money for the Team. I've asked an armada of bloggers, critics and fans (and maybe a cartoonist or two) to each write a short essay answering the following questions: what is your favorite comic (comic book, comic strip, graphic novel, whatever), and why? The Team zine will be a compilation of these essays, an explosion of wildly divergent opinions, and an ideal shopping list to take with you as you plunge into an unfamiliar longbox or used book store. The contributors are an all-star line-up: Derik Badman, Noah Berlatsky, Alex Boney, David Bordwell, Matthew J. Brady, Scott Bukatman, Johanna Draper Carlson, Isaac Cates, Rob Clough, Corey Creekmur, Andrew Farago, Shaenon Garrity, Dustin Harbin, Charles Hatfield, Jeet Heer, Gene Kannenberg Jr., Abhay Khosla, Susan Kirtley, Sean Kleefeld, Costa Koutsoutis, Andrew Mansell, Robert Stanley Martin, Chris Mautner, Joe McCulloch, Ana Merino, Chris Pitzer, Mike Rhode, Jim Rugg, Frank Santoro, Chris Schweizer, Caroline Small, Tom Spurgeon, Ben Towle and Matthias Wivel. The zine will be a word-packed 40 pages, topped off by a cover by some fledgling artist named Richard Thompson. How can you get your copy of this collectors' item? The World Premiere of the zine will be at this year's Heroes Con in Charlotte, North Carolina on June 3-5. Richard and the Team (including myself) will be selling copies there. The price? Five bucks, with every cent going straight to Team Cul de Sac and research into a cure for Parkinson's Disease. After Heroes, we'll make the zine available through the mail, and sell it at other cons too. (If you want a copy, we'll make sure you get one!) Watch this space for more information about the zine--including its title, which is still in flux--as we rapidly approach Heroes Con. Team Cul de Sac, the Parkinson's research fundraising project started by the indefatigable Chris Sparks, has received some inspired contributions by artists and cartoonists. The recent donation pictured above is particularly eye-catching. It comes from Mr. Bill Watterson, who's got a dab hand with a paintbrush and whose beloved Calvin &amp; Hobbes stands as the platonic ideal of the comic strip, or as close to as such a thing is possible. 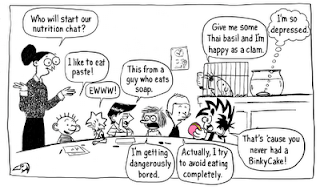 I once saw a comment on a comics thread from someone saying that he'd dreamed about hiking in the Cascades and coming across a church newsletter stuck in some bushes that featured new Calvin &amp; Hobbes strips that were being published nowhere else. That strikes me as eerie and charming and a good measure of the depth to which C&amp;H has permeated the popular imagination. So I was floored when I got a call yesterday from Chris saying that Caty Neis, who's shepherding the Team book project at Andrews &amp; McMeel, had gotten a painting from Bill. An oil painting of Petey Otterloop of all people. After studying it pretty closely for the last consecutive 12 hours or so I can say that he's done Petey as much justice as possible. Adding another dimension to a 2D character is a tricky business and Petey's awkward enough in dealing with the two he's normally confined to. Hello from Team Cul de Sac headquarters! We received a special package this morning containing a one-of-a-kind painting from an one-of-a-kind guy. Wow, I still can't believe it. I have been proudly showing everyone here at Andrews McMeel Universal. I ran into Bill Amend and he was impressed. He says he'd better get on it now. Are you in? 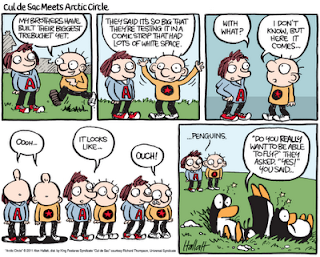 Cul de Sac enters the Arctic Circle! Alex sent us this wonderful strip for the book! I do believe that Alex, from Australia, is so far the winner of the long distance contributer for Team Cul de Sac. Thank you so much! More on Alex! 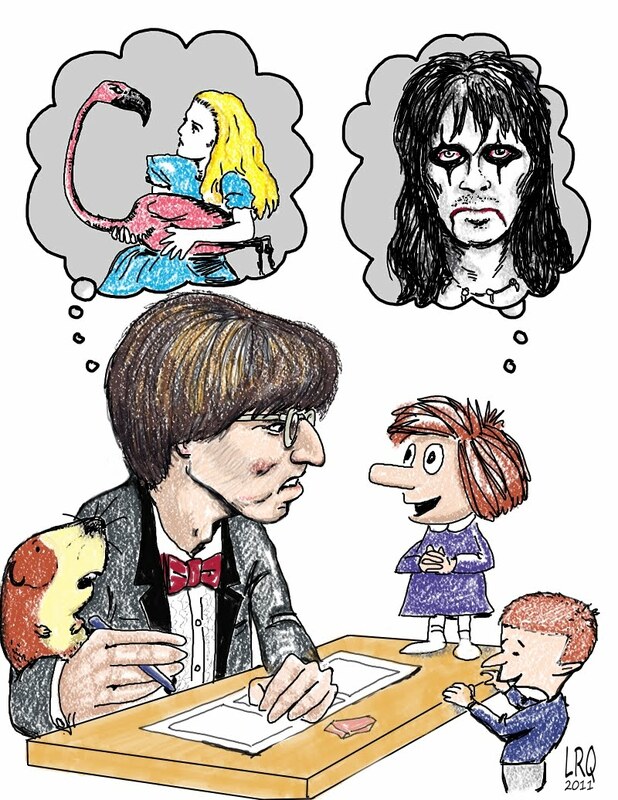 After a getting a degree in biochemistry and working in the pharmaceutical industry for far too long, Alex Hallatt downshifted from London to the South Coast of England to become a full time cartoonist in 1999. 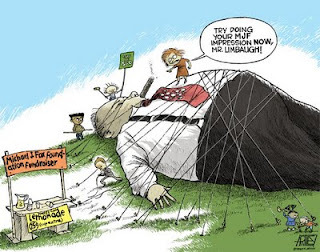 She did the cartoon for Brighton's daily paper for 4 years, before downshifting further to New Zealand. 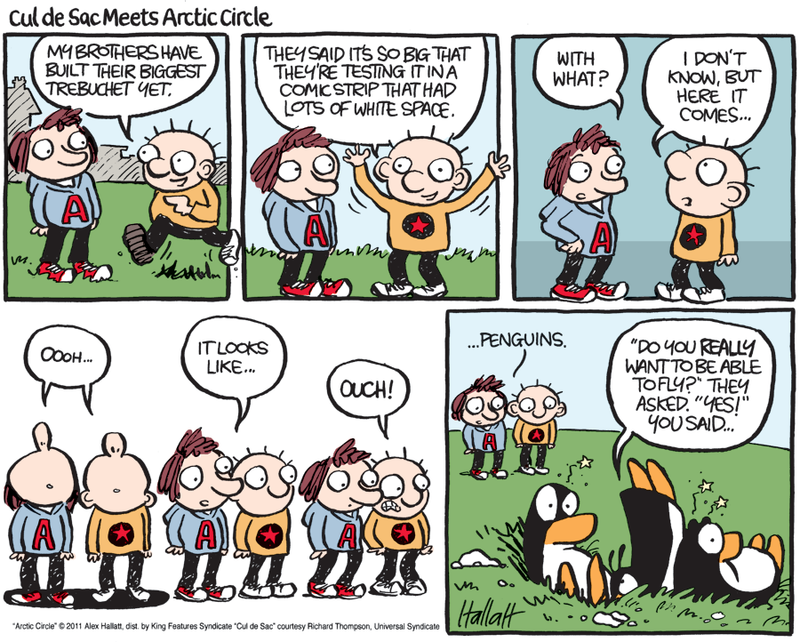 In 2007, her comic strip about three penguins who migrated to the Arctic (Arctic Circle) was syndicated by King Features. It has an underlying environmental theme and appears in newspapers worldwide. Alex crossed the ditch to Australia in 2008 and now lives in Elwood, Melbourne. Nicky510 http://www.nicky510.com/ If one gets into technicalities there are 2 crowtoon series on the same site. Not Just Nicky is the M, W, F strip and Chuckle-A-Duck are the T, Th single panels. I really love this art and just Crow is a big fan of Richards. Thank you so much for this great contribution! In this small world that we live in, I am very lucky to have met one of Richards friends right here in Asheville,NC. Bill LaRocque is one of the most insightful fellows I have ever met. He is also an amazing artist. I am hoping to get to have more dinners with the guy if he ever stays in Asheville for more than a few minutes a month. Looks like I have to wait to see him in Boston! Bill, thank you for all of the support for Team Cul de Sac. Please check out is blog. Below is his kind words about all of this from his blog. 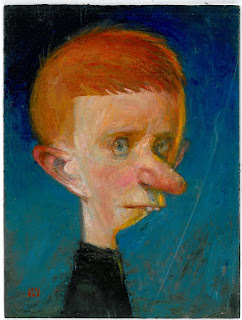 I met Richard Thompson around 1994 at Art Wood’s Museum of Caricature and Cartoon Art in Washington. We were both drawing at a fundraiser and sitting at oposite ends of a table. For fun, we did each other. His caricature of me is still hanging on my wall, mine (of him) I’m told is lining Danders’ cage. Back then, Richard and I both lived in cozy Arlington, Virginia, close to Cul de Sac, the site of his wildly popular comic strip. He was a cartoonist ahead of his time doing illustrations for the New Yorker, National Geographic and Atlantic Monthly. He kept busy and solvent in a variety of markets. Washington Post readers love his Poor Richard’s Almanac feature. Richard is a shy but popular lad with a wicked sense of humor that only seems to show up at the point of his pen. He started attending the annual Reuben awards as the word of his work spread (and when the event could be reached by train.) Now, he’s been nominated again for the NCS’ highest award – the Reuben – greatest of them all. It’s a tough competition and I hope he wins. A couple of summers ago, Richard announced that he has been diagnosed with Parkinson’s disease, a problem he described as “a pain in the fundament” which has slowed him down but has not affected his drawing hand, or his wit. With the help of Chris Sparks, a talentedweb designer I met in Asheville, Richard has set up a web site and fund to raise money for the Michael J. Fox Foundation. 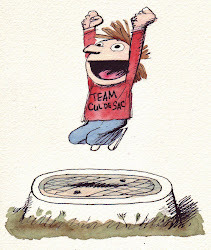 Thanks to the MJFF and Andrews McMeel Publishing,Team Cul de Sac has a book coming out next year for that purpose. I’m hoping they consider my artwork for that project. I am such a fan of Zits, so this was such a wonderful surprise for me! 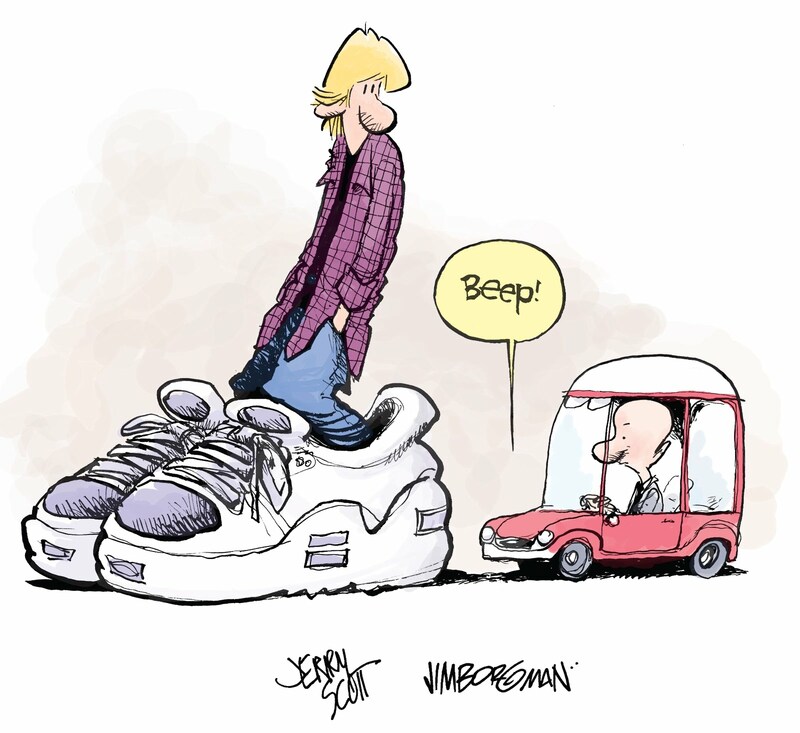 Jim Borgman did this wonderful piece for Team Cul de Sac. I have always loved how fluid Jims art is. 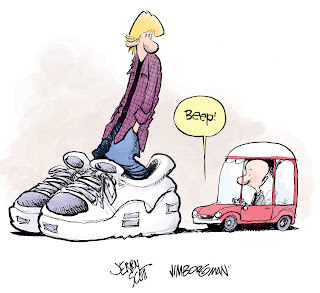 My nephew is 15 yrs old and his shoes are bigger than most compact cars. I hope Patrick's feet quit growing before my brother has to add an addition to the house. Thank you Jim for contributing. Stephan Pastis sent his art to me tonight. He was the first person I asked to join Team Cul de Sac, and he immediately said he'd love to help us. The art is awesome! Hey Family Circus, are you going to let him get away with this?! Please read this stolen post from his blog about out friend Richard. Stephan said it the best. OK, Steve! How much money do you want us to spend on this auction? As much as possible! Steve is turning this into a limited edition print that we will be putting up for auction that will be Signed and Numbered. I can't say how much this tickles every bone in my body! Spot on dear Steve! I hope everyone enjoys this as much as I am! Please check out Steves website!